Lemon Mobiles announced the launch of Stylish and Sleek Opera Mini integrated Dual SIM (GSM+GSM) mobile phone iQ 707. Opera Mini browser was included in the handset which helped to browse the net. 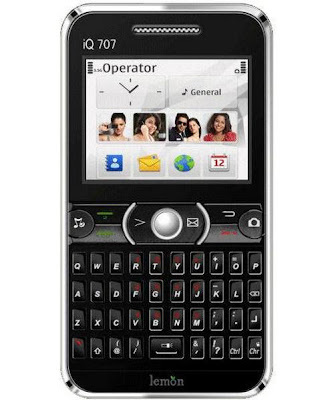 The iQ 707 QWERTY keyboard phone has a 3.2 MP camera, EDGE, Q-band, FM Radio, MP3, Java and a trackball, and the latest addition is the integrated Opera Mini Web browser which has the capability of server side compression, which dramatically improves performance and the overall user experience. It also included a 2.2 inch display screen and extra attractive features like MP3 player, video recorder, FM, voice recorder, Bluetooth, GPRS/WAP, torch, alarm, world clock, calculator, stopwatch and magic shaker. It is available in India now and has a price tag of Rs 4400. Tags: Lemon iQ 707 , Lemon iQ 707 review, Lemon iQ 707 multimedia features, Lemon iQ 707 features, Lemon iQ 707 details, Lemon iQ 707 specifications, Lemon iQ 707 information, Lemon iQ 707 images, Lemon iQ 707 pics, Lemon iQ 707 pictures, Lemon iQ 707 hardware features, Lemon iQ 707 software features, Lemon iQ 707 application features, Lemon iQ 707 availability, Lemon iQ 707 price. PC sync does not work. phonebook from sim can not be copied to PC. PC address book can not be copied to this phone. The Camera Flash is not a flash. But a mere Torch has no enough light to use as a camera flash. No service or update of software available.